With so many different photo booth options out there, how does a bride decide on just one?? Well, look no further. TapSnap is the hottest photo booth on the market for one particular reason, it's actually not a photo booth at all. "TapSnap came about as a reinvention of the traditional photo booth," Bud Lehman, TapSnap 1086 Franchise Owner, said when describing this one-of-a-kind crowd pleaser. In other words, say goodbye to the "booth" in photo booth. TapSnap is an interactive, open-air design. With the choice of providing a green screen as a backdrop or not, TapSnap comes with a 42" touch-screen kiosk, allowing guests to actually draw on the image, change the background and add digital props to their pictures. Along with being able to modify your picture, TapSnap allows you to share it to social media accounts instantly. Simply tap, snap and share! Bud explained the common wedding package includes, "One interactive TapSnap kiosk, access to standard digital props, wedding announcement/logo on each photo, unlimited lab quality prints, real-time photo sharing by email, Facebook or Twitter, wedding Facebook album shared on bride/groom's Facebook page, online gallery of all photos and a Phototainment Specialist (attendant)." But the fun isn't just for brides, corporate and social events can take advantage of this photo experience as well. 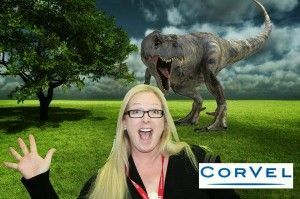 TapSnap is able to display company logos and have the green screen portray a background to further promote the event. Whether you're located in Ireland, Mexico and maybe even Puerto Rico, TapSnap is available in seven different time zones! "One add-on that really sets the event apart is SnapCast. Our brand new SnapCast service streams photos live from the TapSnap system onto TV's and projection screens set up at your event. Promote your event hashtag to see guest pics from Instagram and Twitter too," Bud announced. So why is it time to get rid of the old booth, and bring in the new? 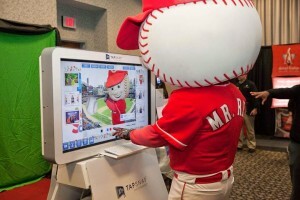 "TapSnap fits in with any event decor, takes up minimal space, and the open-air design makes it simple to take a picture of one guest or an entire family, while other guests have fun watching the action and sometimes, help create the final picture." Take note, brides, add a simple message, a fancy frame, or use your and your hubby's monogram on the picture to make it an easy and quick wedding favor. If you don't believe Bud, then believe us! 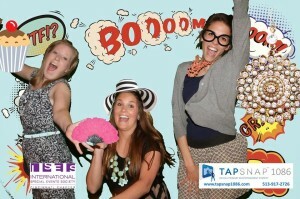 The Center girls (and Alana's Fiance) tried out TapSnap at a previous ISES Cincinnati event and let me tell you, it was hard getting us away from the camera. While our favorite part about this photo experience was definitely thinking of clever ways to pose with the digital props and booth-free space, Bud prefers the dinosaur digital props and backgrounds. "It is simply amazing some of the poses and messages guests come up with while in the clutches of a dinosaur," Bud confessed. We can only imagine what The Center staff would have come up with that night, and we think the whole ISES group would have to agree. Thanks TapSnap for teaching us a different type of photo booth fun. You can learn more about TapSnap by visiting their website at www.tapsnap.net. Or contact Bud, who provides services in Cincinnati, Dayton, Northern Kentucky, Louisville and the surrounding areas. He can be reached at budl@tapsnap.net or 513-917-2726.